दूरदर्शन के पुराने कुछ एक साक्षात्कारों को जानकारी के खजाने के तौर पर देखा जा सकता है, जहाँ एक फनकार खुद अपनी ज़िंदगी के अनछुए पहलुओं से रूबरू कराता था. चूंकि आज के दौर में इन्टरनेट भी जानकारी का अच्छा खासा खज़ाना लिए है और थोड़ा गोता लगाने पर कभी कभी कुछ दुर्लभ मोती हाथ लग जाते हैं. आज ऐसे ही एक मोती , स्वर निधि से आपकी मुलाक़ात कराएँ, जिसने सिने पर्दे के शुरूआती सालों में हिंदी फिल्मो के लिए अपनी आवाज़ भरी . नाम था ज़ोहराबाई अम्बालेवाली . 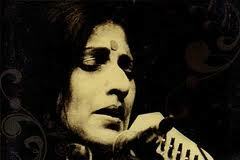 GanaSaraswati Kishori Amonkar , popularly referred as Kishoritai, was born onApril 10, 1931 to famous a singer of Jaipur gharana ‘Mogubai Kurdikar’, a disciple of Alladiya Khan saheb who was doyen of Jaipur ghrana. As expected Tai learnt music from her mother. 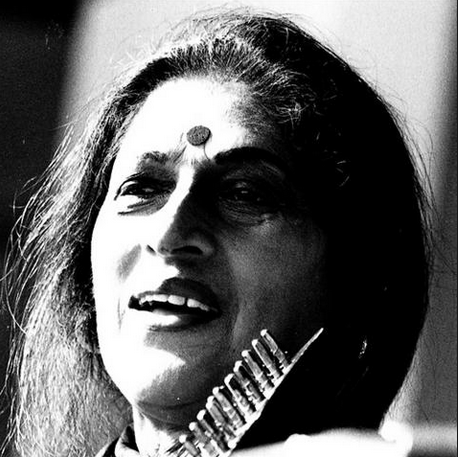 Her mother also ensured that she took lessons from other musicians in fields like Ghazal,thumri and other forms of classical /semi-classical music. She even asked her to get further trained by her competitor ‘Kesarbai Kerkar’ ..However this did not happen due to misunderstandings between Kesarbai and Mogubai . 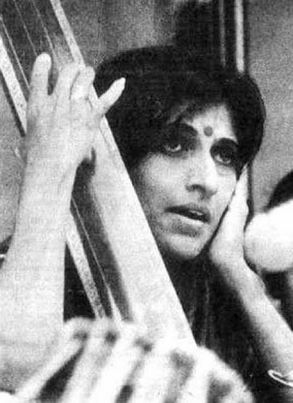 Kishori Amonkar quickly imbibed the nuances of the difficult Jaipur-Atrauli gharana of music. She has developed her own style which emphasizes the emotional content of musical notes while maintaining the rigor of the Jaipur “gaayaki” (singing style). 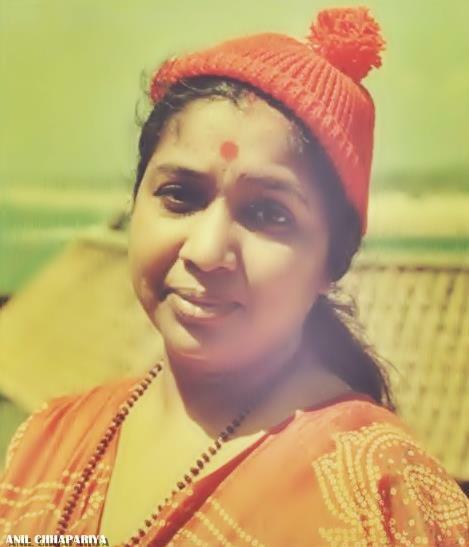 She has achieved this mastery over music through practice, study and meditating over music. 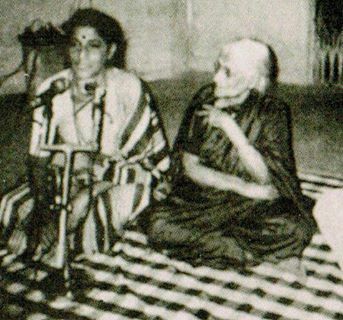 The entire study of the raga is expressed through her performance. 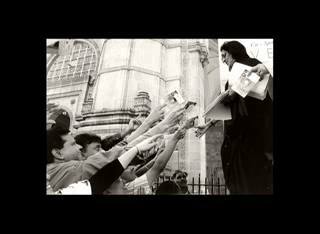 Her deep thinking and study of music is expressed not only though her music, but also through her writings and speeches. 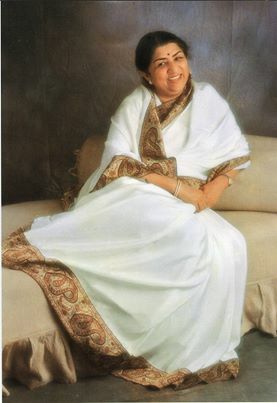 She is an excellent speaker and is famous throughout India for her speeches on RasaSiddhant (Theories of Rasa) in music. She has developed her own style of music suitable for her tone and voice. Listening to her performance is a rich experience. Hers is a mind of a connoisseur, a painter, a devotee and a scholar. All these blend beautifully to enrich the experience of the listener. Her meditative trance like state while she sings is a delight to watch. Her performances are always disciplined and well organized. A musical performance for her is worship to God and that transcends onto the audience as well. 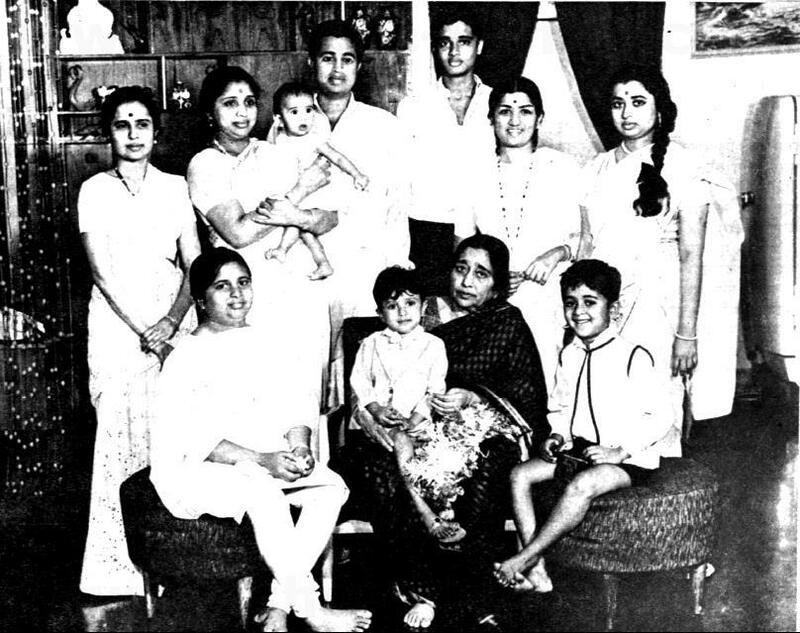 She carried forward the Jaipur legacy by training disciples like Manik Bhide, Padma Talwalkar, Arun Dravid, Raghunandan Panshikar, Meera Panshikar, Nandini Bedekar, Vidya Bhagwat, , granddaughter Tejashree Amonkar, and violinist Milind Raikar. 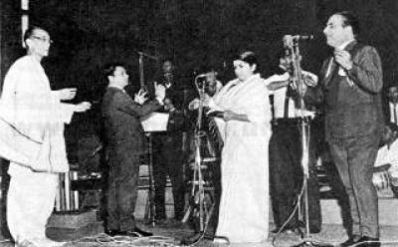 Kishori tai’s first record was of Pat bihag,bhairavi and this jaunpuri drut. (Chhum Chhananan Bichhuva baje‘). I believe in the guru-Shishya parampara. I don’t believe in learning from texts and cassettes. Nowadays, students record, they go home and learn dead music. Learning from a guru is live learning. It is a give and take of souls. Our music is the fifth Veda. The Vedas teach you Brahma Vidya. You cannot learn that from a machine. If you go on contemplating and meditating upon the divine art, I am sure you will reach the ultimate destination of a note – which is Brahma. I am trying my best to reach that. This art needs meditation. It is not that I don’t love the public. It is because of them I am where I am today. I consider each one of you as an embodiment of Raghavendra Swamiji. When I sing, you become Raghavendra… I am seriously moving away from performing. I am waiting for a chance to get into teaching completely. That’s my goal. Listening to guru helps you to get rid of your ‘Ahankar( ego)’. It automatically goes by following guru. 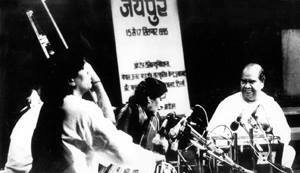 Once during concert I was sitting next to my mother on stage on tanpura. However I was not singing when I was expected to fill the blanks. My mother told me on stage in front of everyone to leave stage if I do not want to sing. I am not teaching for money or publicity but its for your identity. So I need to be serious. Music has to be taken seriously. We have given an entertainment value to our music. Singing, practising and performing, all are different. These are the three aspects of music. I give importance to singing. It is like talking to your soul. It is an inner communion which you are trying to communicate … in the process, naturally it will diminish in value. I believe that Indian music is nothing but the expression of a feeling. If I say, ‘I love you,’ can you measure it? You just have to feel that vibration. We have limited our music to formats. In North India, every raga is sung in a typical form. First alaap, then vistaar, then you put words into the alaap; words in the sthai, then dhruaa … We repeat the entire repertoire. I don’t think one needs to sing dhruta here. Dhruta conveys an entirely different feeling. You sing it when you are restless or have an intense feeling. But we don’t do that. Apologetically, I accept these faults. You do the same in Carnatic music. In a performance you give a break, you give some time for the violin, some time for the mridangam. It is a break from the emotion. You should learn these formats when you are a student. It’s high time that I took the plunge and followed that feeling and experienced it myself. 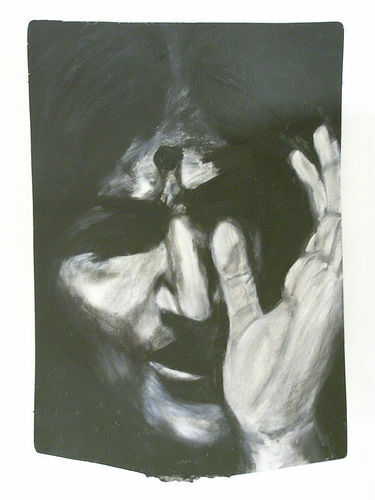 I pray to God to give me the strength to go to that level, which is abstract. The two systems – Hindustani and Carnatic – are more the result of practical tradition, influenced by environmental cultural forces. I think this is a world of notes. We should not put in too many words, too many rhythmical acrobatics into our singing. It is high time instrumentalists got out of the acrobatics with the percussionists. These are just gimmicks. The worst exploitation of the audience is by gimmicky artists. Listeners have been led to believe that they should be excited by a performance. That goes exactly against the principles of Indian classical music, which brings you peace. The burning question …..Do we need Musical gharanas ? Just like the way I don’t understand the meaning of the caste system, I don’t get the idea behind segregation of gharanas. Music is the study of human existence. If Brahmins are supposed to propagate knowledge, how have they served by justifying the caste system? Brahma is present in every human being and every person is capable of music. 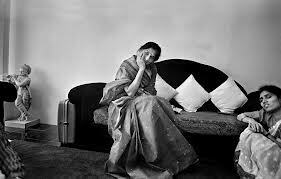 So to me, the gharanas don’t really serve a purpose. At the end of the day, all music is one and they have to spread the knowledge of music and not selective knowledge. Music is Language of Notes. Importance of Tuning the tanpura. scientific rendering of a tanpura is different from its aesthetical rendering; in thc case of the latter, the stress is significant. 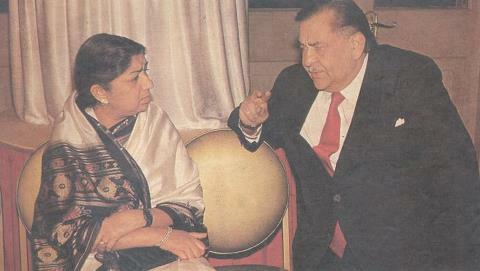 How the Raaga should be presented? …. Introspection and Realisation of Classical music. 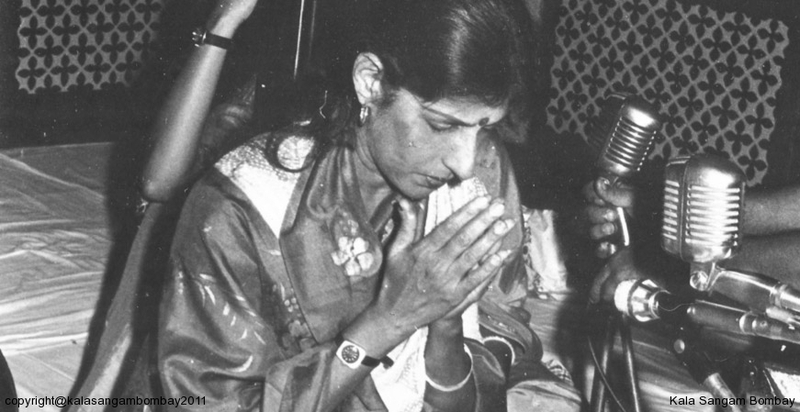 Great mother & an equally great daughter….. Kishori Amonkar trained under her mother, classical singer Mogubai Kurdikar of the Jaipur gharana ! I Stayed away from music for 9 yrs as I had lost my voice It was like live deat but I recovered my music in that phrase. I was born to be singer… I had love and attraction for music even I was not able to sing. I used to whisper music but My mother stopped it. She asked to sing inside that helped me to stay in music all the time and discover meaning of music. I applied Ras siddhant to music as swar siddhant and tried to give my music Immotional expression to surpass technicalities of classical music. लता ने कई संगीतकारों के साथ काम किया ,अगर उनकी फेहरिस्त बनाने लगे ,तो शायद एक अलग लिस्ट लिखनी पढ़ेगी .लता से एक इंटरव्यू में पूछा गया कि अनिल बिस्वास ने एक दफा कहा था कि लता, मेरी (अनिल बिस्वास की ) गुलाम हैदर ,और खेमचंद प्रकाश का शोध है .क्या आप इससे सहमत है ? लता अपने पुराने दिनों को याद करते हुए (कि कैसे कम्पनी बंद होने और पापा बुलबुले के कहने पर वो हरीशचन्द्र बाली के यहाँ गई ,तो वहाँ एक पठान ने लता को रिहर्सल करते सुना ,और ये बात गुलाम हैदर को कही कि एक नई गायिका आई है ,गुलाम हैदर ने उनका गाना रिकॉर्ड किया पर लता की आवाज़ किसी वजह से शशिधर मुखर्जी को नहीं भायी ,और काफ़ी पतली है कहा . इसी दौरान बोम्बे टॉकीज़ में खेमचंद प्रकाश और अनिल बिस्वास ने लता को सुना ,इस तरह सिर्फ मास्टर गुलाम हैदर को ही वो शख्स मानती हैं जिसने उनके फ़िल्मी सफर में एक अहम भुमिका निभायी .मास्टर जी के पाकिस्तान जाने पर एक दिन पाकिस्तान से लता के पास उनका फोन आता है और उन्हें फिल्म बरसात की सफलता पर बधाई दी और कहा कि ”क्यों मेमसाहब मैंने जो कहा था वो ठीक हुआ कि नही’ .लता ने अपने काम के दौरान संगीतकारों से काफ़ी सीखा अनिल बिस्वास से सांस की बारीकियां सीखी, कि कहा, कैसे सांस लेनी चाहिए . खेमचंद ने उन्हें जैसे गाना सिखाया वैसे गाया . वहीं मास्टर गुलाम हैदर से सीखा कि गाने से पहले ये ध्यान दें कि गाने के शब्द क्या है ? उसकी सिचुएशन क्या है ? कि परदे पर कौन उसे गाने वाला है ,लता के मुताबिक वो कहते कि ‘अगर लोरी हो तो तू माँ बन ,अगर गाने दुखी है तो तू दुखी होकर गा . शंकर जयकिशन से लता ने क्या सीखा और लता से उन्हें क्या मिला ? लता : मैंने उनसे कुछ नही सीखा बल्कि मैंने कई दफा उनके गीतों में अपनी और से योगदान दिया उनके कई गीत ऐसे रहे जिसमे मैंने अपनी और से आलाप जोड़े या उन्हें इमप्रूव किया . क्या आपने कभी गीत के बोल कभी बदलने पर ज़ोर दिया ? लता : बहुत बार बदले ,जहाँ द्विअर्थी बोल होते ,मैं ऐसे गीतों को गाने से मना कर देती , ‘संगम’ के गीत मैं का करूँ राम मुझे बुड्ढा मिल गया ,इस गीत को मैंने बस ऐसी ही (अनमने मन से ) गा दिया ,क्योंकि राज कपूर ने काफ़ी वक्त लेकर मुझे समझाने की कोशिश की ,ये गीत वैजयंती माला पर फिल्माया जायेगा .परदे पर इसमें कुछ बुरा नही नज़र आएगा ,इसमें कुछ वल्गर नज़र नही आएगा .और फिर धीरे धीरे संगीतकारों को खुद भी इस बात का अंदाज़ा हो गया कि इस तरह के गीत हम गीता ,आशा से गवाते है . ‘बरसात ‘ के बाद नौशाद साहब की ‘अंदाज़’ आई . लता बताती हैं कि नौशाद साहब से एक तरह से पारिवारिक संबद्ध रहे ,इतना ही नही, परिवार के एक विवाह समारोह में वो व्हील चीएर पर ही सही, लेकिन आये ज़रूर थे . वो कहती हैं नौशाद के संगीत में बना गीत जाने वाले से मुलाक़ात ना होने पायी उनकी पसंद का गीत रहा . ‘लोता मेरे गाने को चार चाँद कर देना’ ,फिल्म ‘मिस इंडिया ‘ (नर्गिस ) की रिकॉर्डिंग के दौरान दादा ने उनसे गीत को काफ़ी ‘सॉफ्ट‘ गाने को कहा ,दादा ने जैसा कहा वैसे लता गा कर चली गई .अगले दिन लता के पास एक व्यक्ति आता है और कहता है कि दादा चाहते हैं कि आप उस गीत को एक बार दोबारा री रिकॉर्ड कर दें क्योंकि वो काफ़ी ‘सॉफ्ट ‘हो गया है .